A 36-year-old asymptomatic female had a routine chest radiograph to exclude pulmonary tuberculosis, as part of an employee wellness programme. There was opacification of the right lower thorax. Computed tomography and venography demonstrated an incidental right Bochdalek hernia with interruption of the inferior vena cava (IVC) and hepatic venous collateral continuation. The association of a Bochdalek hernia with an anomaly of the IVC is rare, with only one case described in the literature. A 36-year-old female underwent a routine medical evaluation as part of an employee wellness programme. She was diagnosed positive for human immunodeficiency virus (HIV) and was referred for a chest radiograph as part of a work-up to exclude pulmonary tuberculosis. The chest radiograph demonstrated opacification in the right lower chest (not shown). The differential diagnosis included an elevated right hemidiaphragm, a diaphragmatic hernia or a subpulmonic pleural effusion. She had an absolute CD4 count of 752 x 106/L and a slightly elevated aspartate transaminase (AST) of 42 U/L (normal range 13-35 U/L). Other biochemical markers were normal. A chest drain was inserted but as no fluid drained from the tube it was removed, and she was referred for further evaluation. 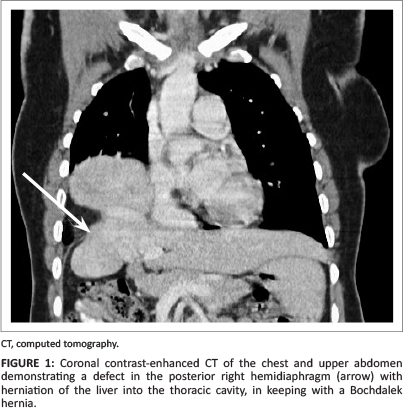 Contrast-enhanced computed tomography (CT) of the chest and abdomen demonstrated a posterior defect in the right hemidiaphragm with herniation of the liver into the thorax (see Figure 1). The intrahepatic component of the inferior vena cava (IVC) was interrupted and drained directly into a medial hepatic vein in the right lobe of the liver. The hepatic venous anatomy was distorted. It consisted of a collection of dilated, tortuous veins within the liver parenchyma. One of the hepatic veins drained directly into the right atrium (see Figure 2). The azygous vein was also enlarged (see Figure 3). The portal venous system was not affected. 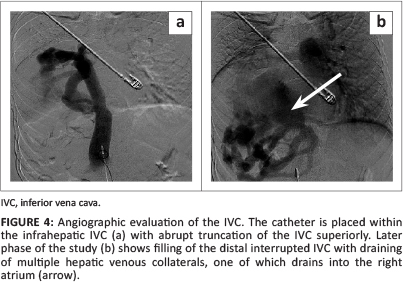 The findings were confirmed on a venography study of the IVC (see Figure 4). 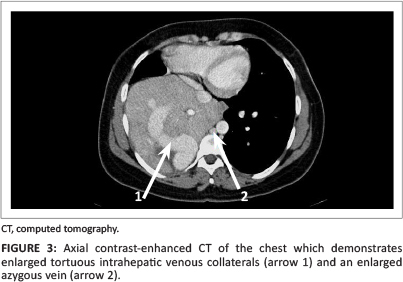 The final diagnosis was an incidental right-sided Bochdalek hernia associated with interruption of the IVC with continuation via the azygous vein and hepatic venous collaterals into the right atrium. Bochdalek hernias are usually detected in the neonatal period as the hernia causes compression of the lung parenchyma, which may cause respiratory distress and cyanosis.4 Bochdalek hernias were found to be asymptomatic in 14% of patients (usually in females with right-sided hernias) in a review conducted by Brown et al.3 They also found that 12% of patients with a Bochdalek hernia may have associated cardiac, pulmonary or gastrointestinal abnormalities but associated IVC abnormalities were not described. An adult patient presenting with the combination of a right-sided Bochdalek hernia and an interrupted IVC with hepatic venous collaterals, as described in this case report, is an extremely rare occurrence. Patients with Bochdalek hernias should always be investigated in order to exclude associated anomalies. F.I.I. and R.H. (both from Steve Biko Academic Hospital and University of Pretoria) were initial contributors and main authors. A.C., F.I.I. and S.A. (from Steve Biko Academic Hospital and University of Pretoria) were involved in the interventional radiology procedures and provided interpretation of the radiological images used in the article. P.N. and S.E. (both from Steve Biko Academic Hospital and University of Pretoria) provided clinical input and advice in write-up. 7. Mori M, Sakamoto T, Aoki S, et al. A case of Bochdalek hernia accompanied by complicated anomalies of the IVC and hepatic vein. [Case Reports, English Abstract, Journal Article]. Rinsho Hoshasen. 1988;33:495-498.